A forest frog has managed to do what no other vertebrate has done before: change the actual texture of its skin in the blink of an eye. The marble-sized frog, discovered in 2006 by researchers in Ecuador, grows spikey tubercles, or tiny growths, when it's placed near moss, allowing it to blend in. But when it's not near moss, a group of researchers write in a newly-released paper, the frog's skin is smooth and sleek. 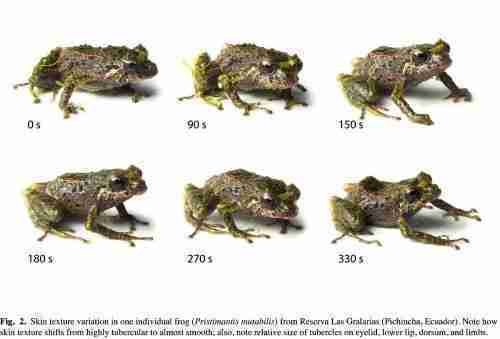 For this reason, the creature was dubbed Pristimantis mutabilis, or mutable rainfrog. The finding was made almost accidentally, reports The New York Times. "We took a specimen back to the house in a cup to photograph it, and when we looked in the morning, we thought we had grabbed the wrong frog," Katherine Krynak, a biologist at Case Western Reserve University and an author of the study, told the Times. "We put the frog back in the cup with some moss, and soon, it had the spines again." 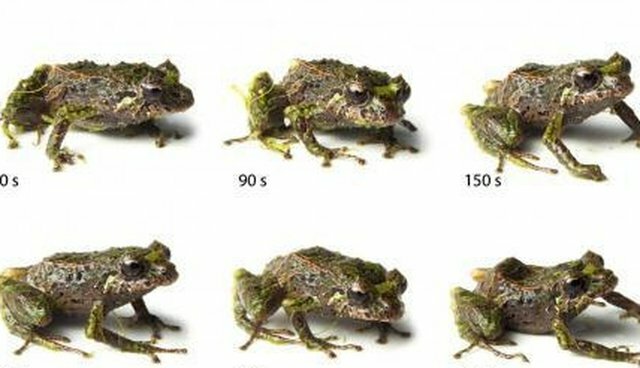 The study, recently published in The Zoological Journal of the Linnean Society, is the first to show shape-shifting abilities in vertebrates (though the researchers did find another frog species with similar talents).